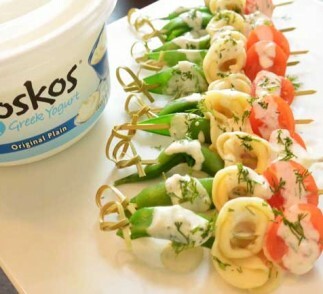 An incredibly fun and unique way to serve pasta, this colorful appetizer is the perfect finger food for parties, holiday gatherings and potlucks. Wonderfully flavored with a mustard-dill vinaigrette, the skewers are simple to put together and will get you rave reviews. Place sugar snap peas in a small bowl; cover with plastic wrap. Microwave on high for 2 minutes. Let stand, covered, 2 minutes. Rinse under cold running water. Thread each skewer with 1 sugar snap pea, 1 tortellini, and 1 tomato half. Place skewers in a 13-by 9-inch baking dish. Pour Mustard-Dill Vinaigrette over skewers, turning to coat. Cover and chill 4 hours. Transfer skewers to a serving platter; discard any remaining vinaigrette. To make the mustard-dill vinaigrette: Place all ingredients in a small bowl and mix well.